Description: It is a small, columnar cactus with golden spines. 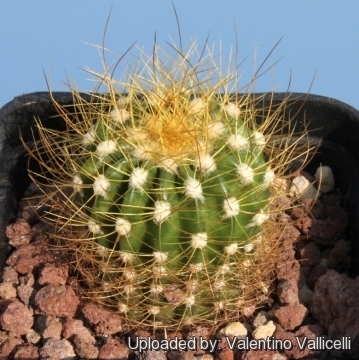 Cultivation and Propagation: Requires porous cactus soil. Prefers bright light to morning sun. Water thoroughly when soil is dry to the touch. Prefers semi-tropical temperatures. Protect from frost. Propagation: Usually by seeds or by cuttings (if available) in summer.